This Barcelona Map shows the location of attractions, places of interest & transport . Click the name in the right column below to highlight the location on the map. Barcelona is the capital of Catalonia and the second largest city in Spain, located on the Costa Brava in North East Spain. It's Spain's second largest City with 4.5 million inhabitants. Madrid the capital of Spain is the largest city 6 million inhabitants. The city of Barcelona has the benefit of a large metropolitan City, a busy sea port and a beach resort combined together. The city is blessed with an efficient bus services and Metro (Underground) system with stations scattered throughout the city. Barcelona has 4 km of sandy beaches, making it a beach resort, a busy harbour and is also a popular City break. It's mix of history, cosmopolitan atmosphere , large beaches and culture draws tourists from all over the world. Because of Barcelona's size the location of your hotel will be important, and will vary depending on the reason for your visit. The favoured language of the area of Barcelona, and the Balearic Islands is Catalan rather than the national language of Spanish. The most eye catching building on the Barcelona skyline, this unfinished cathedral masterpiece designed by Gaudi is a must on your sightseeing list. La Rambla is Barcelona's best known Streets and well worth a stroll along its length. Full of market style stalls many selling flowers, its street performers and living statues. 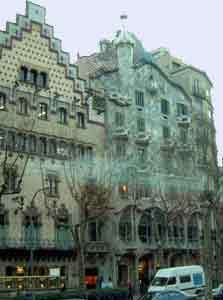 One of Gaudi's famous buildings, El Palau Guell , is located towards the lower end. The Christopher Columbus Monument is a statue of Christopher Columbus, the discoverer of the West Indies and America. The statue surmounts a tall column with a height of 60 Metres. The discoverer of America is pointing to the East away from his discovery America located to the west. When he set out to the west he was looking for a westerly route to the spice islands in the East and thought he had found them. 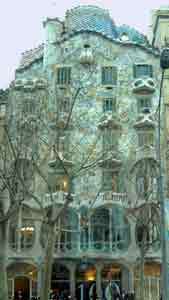 The Picasso Museum is across Via Laietana, down Carrer de la Princesa, and right on Carrer Montcada a street known for Barcelona's most elegant medieval palaces. Displays include childhood sketches, pictures from the beautiful Rose and Blue periods. The Miro Foundation was a gift from the artist Joan Miro to his native city and is one of Barcelona's most exciting showcases of contemporary art. The airy, white building was designed by Joseph Lluís Sert and opened in 1975. Is the nearest to the city centre and consequently is usually the busiest. 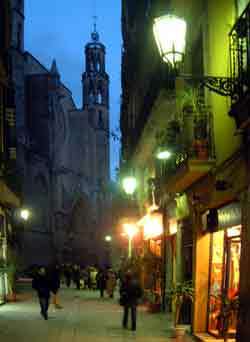 Barcelona has a fast array of very good restaurants. For a snack have a tapas in one of the many Tapas Bar. If you are new to taps then check that the bar has a counter display of the tapas selection then it is easy to choose one or two that you fancy. Tapas are usually served with bread. 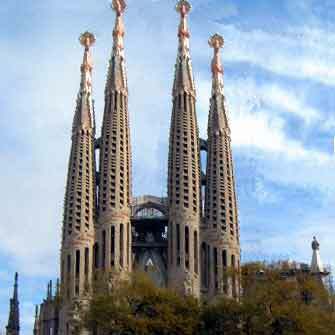 Barcelona is a shoppers dream with all the latest fashions in clothing , headwear & footwear for Ladies, men and children. The office is located underground under Catalunya Square near the fountains. Look for the Large pillars with ' i ' on them. Open: Monday to Friday 8.30am 9.30pm. Saturday 8.30am 2.30pm. Barcelona has excellent public transport systems. Car hire and driving are not recommended because of heavy traffic and poor parking facilities. This method of travel allows you to see where you are going, but is subject to traffic holdups. Luckily there are exclusive bus / taxi lanes to help speed your journey. Route maps are displayed at bus stops and buses run from around 5:30 am to 11:30 pm. Multi journey tickets are much cheaper than buying single fares. This bus runs roughly every 25 minutes around the tourist sightseeing attractions, the complete journey takes approximately 2 hours per route. A one day ticket that can be purchased on the bus costs around €15.00, a two days' ticket is only a few euros more. Costs are reasonable, and are metered. Make sure the meter is on. Current fares are posted inside the cabs. The location is in the Andalusian quarter (Barrio Andaluz), up the mountain is in the specially built village of Poble Espanyol, which has building styles from all of the different areas of Spain known as "autonomous communities". I recommend that you arrive early so you can wander around the village. The price of the show usually includes entrance to the village. By bus nº 50 & 13 stop at "Plaça Espanya"
By Metro line 1 & 3 stop at "Espanya". "Time Out" Guide to Barcelona Providing the visitor with in depth, authoritative coverage of the Catalan capital, this guide contains information on where to stay and eat and includes details on restaurants, bars, museums, art galleries and nightlife. 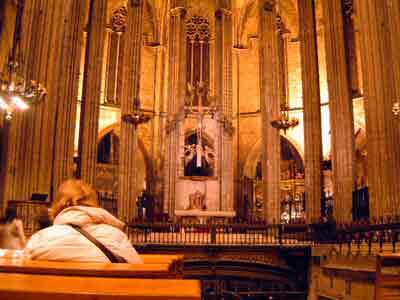 It is researched and written by Barcelona residents themselves. Packed with information, this double sided map is printed on waterproof paper. The colours used for mapping have been chosen after research into what works best in different light conditions, so the map should be as easy to read under street lamps as it is in daylight. The main area of the city is covered, with an enlarged downtown city centre street map on the reverse. A comprehensive street index and clearly marked one way streets and pedestrianized areas should make this map ideal for use on foot, driving, or using public transport.